Playful and creative, vibrant and young, Nantes has been literally turned upside down by art! Located in the south of Brittany, it is just 45 minutes away from the Atlantic Ocean. Visit its magnificent castle of the Dukes of Brittany, follow the footsteps of Jules Verne (born in Nantes) and ride on the Grand Elephant at Les Machines de l’île. Stroll in the medieval quarter, enjoy a collection of 30 contemporary artworks displayed in the city and along the Estuary of the Loire ! Opening hours: Many shops are open Monday-Saturday 9am-7pm. 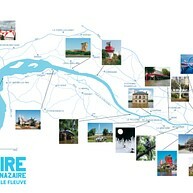 Do you know of any other destination that – in one single kilometre – can bring together; a walk along the banks of the river Loire on a 12m high Grand Eléphant, a XVth century castle, a history museum that uses contemporary scenography to conjure the past, present and future and on top of that, an artistic trail designed by some of today’s greatest artists? Come to Nantes to discover the “cité des ducs” and a single part of its rich architectural and cultural heritage. Nantes has 1,001 attributes; none more important than the one making you want to come on another journey in Nantes! Just follow the green line ! 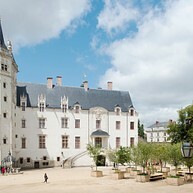 The Castle of the dukes of Brittany houses the Nantes History Museum. The former Ducal Palace also holds temporary exhibitions and cultural events all year round. A free-access rampart offers many viewpoints of the fortress and of the city. 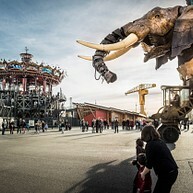 The Machines de l’Ile is an artistic, touristic and cultural site in Nantes since 2007. Three major artworks, the Great Elephant (2007), the Merry Go Round of the Marine Worlds (2012), the Spider (2016) and the Huge Heron Tree (project in 2021) symbolise doors to the world of dreams and magical journeys. A mixture between the invented worlds of Jules Verne and the mechanical universe of Leonardo da Vinci. All year long, from Nantes to Saint Nazaire it's an open air art collection. Each creation, signed by an internationally renowned artist leads you to an atypical place or to a remarkable site of the estuary of the Loire river. Since 2007, over 30 artworks have now been the stones of a monument scattered along 60 km. This artistic trail will make you discover a fascinating territory, its heritage and its natural resources. Take advantage of a river cruise to reach the point where the Loire runs into the ocean and see the estuary from the unique viewpoint of… the river: working docks, remarkable natural areas, and the Estuaire art installations communicating with their surroundings. Embark on a colourful rhythmic night time river cruise from July to October. Nantes was the capital of the slave trade in France: it organised 43% of the French slave trade shipments in the XVIII century. The City wants to assume its past and give shape to the memory via a powerful political gesture. The Memorial to the Abolition of Slavery in Nantes is the biggest in Europe. Located on the Quai de la Fosse, a symbolic place in the city that has seen many slave ships to Africa, the Memorial has been open to the public since March 2012. Following an international competition, the city of Nantes has entrusted the design of the Memorial to Krzysztof Wodiczko, a Polish artist and Julian Bonder, an Argentinian architect. Visit the botanical garden, a priceless collection of exotic plants. Trees from America, Asia and Africa.Nantes boasts 1,000 hectares of green areas open to the public, with some 1 million plants produced every year. 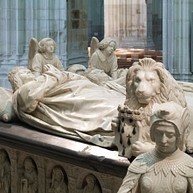 This impressive cathedral is home to the tombs of Francois II, the last Duke of Brittany, and his second wife Marguerite de Foix. Construction of the Gothic building started in 1434 and lasted for four centuries. Located alongside the Canal Saint-Felix, the old biscuit factory LU revamped by the architect Patrick Bouchain lives to the rhythm of an atypical art centre: the Lieu Unique. 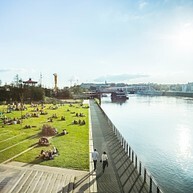 Here, you will find a bar, a shop, theatre (nationwide tour venue), a hammam, a day nursery and the picturesque tower of the old LU biscuit factory which offers a uniquely panoramic view of Nantes. Built in 1788, the Graslin Theater is an impressive building with an entrance boasting eight Corinthian columns and marble, gold and royal blue velvet inside. 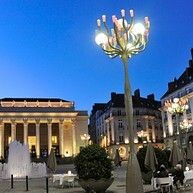 It is home to the Opera of Nantes and marks the focal point of the Place Graslin. The famous brasserie La Cigale is in front of it. The museum inside this great bourgeois mansion depicts the life and works of writer Jules Verne (born in Nantes in 1828), one of Nantes’ most famous citizens. 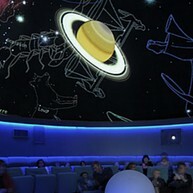 Embark on a voyage through space as the planetarium brings our universe to life. Located near the Jules Verne museum. 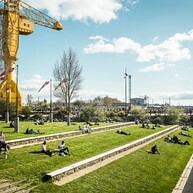 The Nantes Tourism Office called Nantes Tourisme or Le Voyage à Nantes “A journey To Nantes” organises a variety of general and themed tours of the city. Starting in 2014 the Voyage à Nantes has given the town’s retailers the chance to have their brand reinterpreted by selected artists.